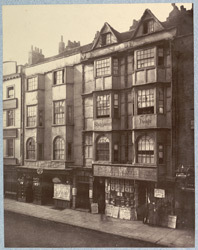 "Howel, writing in the middle of the seventeenth century, says of Aldersgate street: 'This street resembleth an Italian street more than any other in London, by reason of the spaciousness and uniformity of buildings, and straightness thereof, with the convenient distance of the houses; on both sides whereof are divers very fair ones, as Peter house, the Palace now and mansion of the most noble Marquis of Dorchester. Then is there the Earl of Tenet's (Thanet's) House, with the Moon and Sun Tavern [s] very fair structures.'" In 'Photographs of Old London' Alfred Marks explains that the legend connecting the Half Moon Tavern with Shakespeare "...is quite modern and destitute of foundation."